I've been dreaming about decorating today. I like mixing french antiques and art nouveau pieces with farmhouse furniture. I'm looking forward to putting a home together in the future. I'm also looking forward to having the funds to get some special pieces reupholstered. 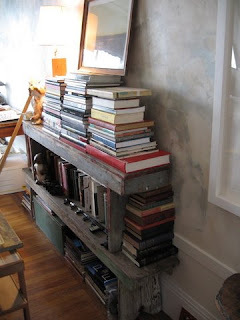 I really like this bookshelf and the wall behind it. The wall reminds me of a New Orleans parlour and the movie Fur (Robert Downey Jr's apartment on that film was gorgeous). 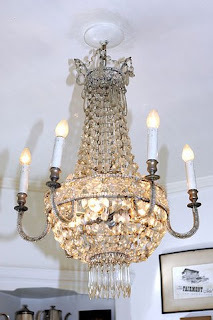 I hope to own an antique french chandelier one day. I would love to have one hanging over an old rustic dining room table. 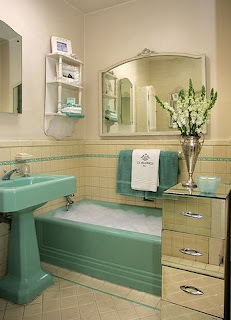 I love most everything about this bathroom. The tub is too small though. Oh, a girl can dream, cant she? Hey Mommy, keep your eye out for me at the estate sales. You always find beautiful treasures. Wow that is a beautiful bathroom.